If you love candles as much as this beauty chick, then you'll be totally psyched about this new beauty giveaway! 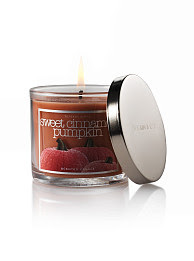 Because I'm giving one lucky person the chance to win the Slatkin & Co. Sweet Cinnamon Pumpkin Filled Candle. This 4oz. beauty burns for hours on end and retails for $9.50. Entering is easy. Simply enter your name and email address in the box below, and check back on Friday, November 21 to see if you've won. It's that simple! This giveaway is open to US residents only. Giveaway runs until Thursday, November 20 at 11:55pm EST. One entry per person, email address and IP address. Multiple entries will be disqualified. thank you, and good luck to everyone who entered. I can almost smell it now. I'd love to win this candle! Thanks so much! Thanks for having the contest, I bet the candle smells heavenly. This would be nice for the holidays. Thanks for having the contest!